Colic root is a native North American perennial plant; its thick, fibrous rootstock produces a rosette of yellow-green, long, pointed, lanceolate, spreading basal leaves. 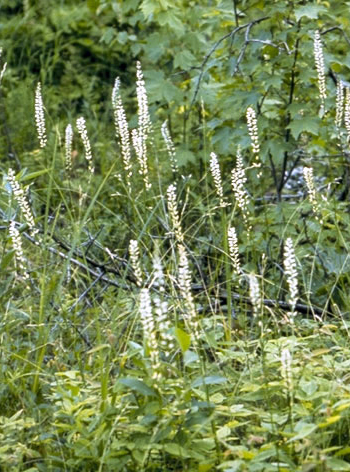 The numerous white tubular-oblong, somewhat bell-shaped flowers grow in a terminal spike-like raceme on an erect, flower-stalk that reaches 1 1/2 to 3 feet in height. Flowering time is from May to August. The fruit is an ovoid capsule containing many oblong, ribbed seeds. Grows in grassy or sandy woodlands, barren places, in acid or peaty soils in the eastern half of North America, from southern Canada to the Gulf of Mexico. Contains diosgenin, which has both anti-inflammatory and estrogenic properties, vitamin E.
Containing vitamin E as a preventative to miscarriage, it is dependable and free from affects during the entire period of gestation (pregnancy). Be sure to use only dried rootstock. A decoction or tincture has been used for flatulent colic and for other digestive problems. Recommended for menstrual problems such as dysmenorrhea and menorrhagia. Stimulates appetite, jaundice, rheumatism, and a general tonic. Contains diosgenin, which has both anti-inflammatory and estrogenic properties. The dried rootstock is used. Decoction: boil 1 tsp. dried rootstock in 1 cup water. Take 1 cup a day, a mouthful at a time. Tincture: a dose is from 15-40 drops. For menstrual problems, take in hot water. Use dried rootstock only. The fresh root, which is toxic, causes unpleasant internal effects, including dizziness, intestinal pains, vomiting and purging. The toxic effect is lost in drying.